In the summer of 1970, Bob Myrick was deciding on his next chapter in life. He had just graduated from Blair High School in Hattiesburg, Mississippi, where he had starred in three sports, and he now had college scholarships on the table for football, basketball, and baseball, plus an offer to play professional baseball after the Baltimore Orioles had drafted him in the twenty-ninth round. While Myrick’s athletic future was undecided, one thing was certain: all roads led to a future in the family business. Since the age of thirteen, Myrick had spent time working for Economy Supply, a building supply company that was founded by his grandfather in 1941. After consulting with his parents, Myrick decided to attend Mississippi State University on a baseball scholarship, where he would be the second member of his family to play baseball for the Bulldogs. Nearly fifty years earlier his great-uncle Buddy Myer was a star shortstop for MSU and went on to become an all-star second baseman during his seventeen seasons with the Washington Senators and Boston Red Sox. Professional baseball was the last thing in Myrick’s future plans. His idea was to trade baseball for a college education, then go directly to the family business after graduation. His mediocre statistics for average teams were hardly any reason for him to be considered a major league prospect. Myrick did pitch on one great college team in his freshman season when MSU made it to the College World Series before exiting the tournament. During his sophomore year he had the privilege of pitching in his school’s first home night game. He captained the MSU squad as a junior and senior, but both seasons saw the team post losing conference records. Myrick did have good statistics in his senior season with a 5-3 record and 61 strikeouts in 572/3 innings pitched. Despite his success, he never considered going to the next level, but did enhance his education in the building supply business by working in the family business during his summers. Myrick was still unenthused over a professional baseball career, and he ignored the baseball draft that followed his last collegiate game. Never could he have imagined that the Mets would be calling. “When the June draft of 1974 came around, I was drafted so low [in the twentieth round] that I didn’t hear about it until a week later,” said Myrick. The Mets assigned Myrick to pitch at their lower level A-league team in Batavia of the New York-Penn League. In his first season he won three, lost five, and struck out 62 batters in 82 innings. Impressed with the rookie, the Mets sent him to their Triple-A club in Tidewater at the tail end of the season, where Myrick pitched two innings. At Jackson, Myrick won seven games, lost four, and posted a respectable 3.26 earned run average. Also impressive was the fact that he allowed just 98 hits in 126 innings pitched. Once again, he was sent to Tidewater to finish out the season. Pitching out of the bullpen, he won all three of his decisions, and the Mets organization began to believe that Myrick was a true candidate for the Mets bullpen. “I think Myrick can pitch against major league hitting,” said Mets manager Joe Frazier. 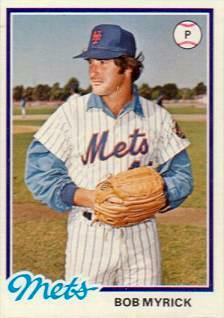 Myrick would begin the 1976 season in the bullpen for Tidewater. After striking out 22 batters in 24 innings, he got the call to the big leagues. When he received the good news, he packed his bags and drove through the night before arriving at Shea Stadium right before game time on May 28th. He reported to the Mets and manager Joe Frazier, a man he knew from Tidewater. In 1975 Frazier managed the Tides to the International League Championship. “Joe was a fiery guy. He really pushed the younger players. He really helped me a lot,” Myrick recalled. While putting his belongings into his new locker, the veteran all-star pitcher whose locker was next to his introduced himself and welcomed him to the Mets. “Tom Seaver was super nice and a class act,” Myrick said about the Hall of Fame hurler. “He was down to earth. He always helped the younger players. Off the field he was comical, but on the field he was all business.” As luck would have it, he was called upon during his first night in a Mets uniform to relieve starting pitcher Craig Swan against the Cardinals after Swan gave up a grand slam in the fifth inning. However, the rest of his first day experience in the Big Apple wasn’t as pleasant. During the night his car was broken into at the parking lot of the Idlewood Airport Motel, where Myrick was renting a room, and his stereo and clothes were stolen. On July 27th, Myrick hurled his first career win in Philadelphia. He had entered the game in the bottom of the fourth with the Mets trailing, 1-0. He began the inning by striking out Johnny Oates and opposing pitcher Tom Underwood. In the top of the fifth Myrick batted in the first run of his career on a groundout to give his team a 2-1 lead. In the bottom of the fifth he walked Mike Schmidt, but struck out Phillies slugger Greg Luzinski. In the seventh, Skip Lockwood came on to nail down the victory. Late in the season, Frazier decided to give Myrick a starting assignment against the Expos. The rookie was victimized by shabby fielding, and he did not last four innings, taking his first major league loss. He finished the season with one win and one loss, and an earned run average of 3.21 for a team that finished in third place with 86 wins in the tough National League East division. On June 24th, Myrick started the annual New York City Mayors Trophy game against the Yankees. He hurled five innings, allowed four hits and just one earned run in a 5-4 Mets win. On July 6th he went on the disabled list after it was reported that he sustained a tear of a rib cage muscle. Three weeks later he was reactivated, and on August 5th he came on in relief and retired the Giants in the last two innings to earn his first win of the season. On August 12th he started in Pittsburgh and struck out seven in five innings, but Phil Garner went 3 for 5 while clouting a home run in a 6-5 Mets loss. “He [Garner] was one of the toughest hitters I ever faced,” Myrick recalled. “Faced with a golden opportunity to slice into the Dodgers lead, the Reds found young Myrick performing in storybook style,” wrote Joe Durso of the New York Times. Myrick pitched well for 6 innings by limiting the Big Red Machine to just one run, but did not get a decision. Because of his good performance against the Reds, manager Torre decided to place Myrick in the starting rotation. On August 30th he made his third start of the season and lost in the Astrodome. A week later in Atlanta, he made another start and gave up four runs before retiring a single batter. That ended Myrick’s days as a starting pitcher. On September 11th, he beat the Cubs at Wrigley Field in relief, pitching 2 1/3 scoreless innings for his first career save, and on September 30th in St, Louis he hurled 3 1/3 scoreless innings for another save. Myrick appeared in forty-four games in 1977. He won two games and had two saves with an earned run average of 3.61, while pitching 87 1/3 innings. On a pleasant fall day following the season, Myrick was playing with his dog, Stanley, on the tennis court at his rented home in Long Island when he stepped on a tennis ball and sustained a fractured ankle. Although the break wasn’t considered serious, Myrick would have his leg in a cast for the next four weeks. The injury may have been a sign of things to come for the 1978 season. In the Mets clubhouse after a loss, Myrick sat silently on his stool while facing his locker, and with his hands clasped behind his head. He was now 0 and 3 for the season after surrendering a 1-run lead in the bottom of the ninth in Atlanta. Myrick continued to struggle. On May 13th he gave up a two-run homer to Enos Cabell, who was 0 for his last 22. On May 18th, Myrick appeared in his last game with the Mets. Torre sent him down to Tidewater with the hope that he would regain his confidence. Myrick began his 1979 spring training on the disabled list. A flare up of tendonitis in his pitching shoulder sidelined him for twelve days, and it also destined him to begin the season in Tidewater. On June 16th, at the trade deadline, he was traded to Texas along with minor league pitcher Mike Bruhert for starting pitcher Dock Ellis. The Rangers assigned Myrick to their Triple-A farm club in Tucson, but Myrick had a disappointing season with the Toros, and the Rangers released him. In 1980, the Mets re-signed Myrick. He began the season in Tidewater before being traded to the Chicago Cubs for a Double-A outfielder named Todd Winterfeldt. The Cubs assigned Myrick to their Triple-A operation in Wichita, where he seemed to find his old form again. In 1981, Myrick reported to the Cubs spring training camp in Mesa, Arizona, with the hopes of getting back to the major leagues. His chances appeared to be very good. A big reason for Myrick’s fine season was mostly due to learning how to throw an off-speed pitch, and he had a lot of success in throwing it. “That’s a big thing for any pitcher to have: complete confidence in a certain pitch,” added Moss. But on March 6th, Myrick was forced to leave practice due to tendonitis acting up again in his left shoulder. Once again, he would begin the season in triple-A, but after a slow start due to an elbow injury, and his lame shoulder, he received his release to end his professional baseball career. Myrick and his wife, Debi, returned to Hattiesburg, Mississippi, after the 1981 season. He went directly into the family business. On August 23, 2012, Bob Myrick suffered a heart attack and died in his hometown of Hattiesburg. He was 59. Following funeral services, he was interred at Roseland Park Cemetery, Hattiesburg. Survivors included his wife and four sons, Adam, Joel, Daniel, and Ben. New York Times, 1976, 1977, and 1978. Interview with Bob Myrick on November 11th, 2007. Bob Myrick File at the A.Bartlett Giamati Research Center. Interview with Bob Myrick. November 11, 2007.